Don't let harmful toxins being stored in your body ruin your chances for success in healthy weight loss! Get the natural body cleanse and detox all in eating watermelon. Getting a natural body cleanse can be as easy as incorporating water-rich watermelon in your diet coming out with a cleaner sense of being while empowering your body to turn up the heat against built up toxins in your body in addition to adding yet another tool to your list of great antiaging technique keeping you always looking young. Is eating watermelon good for you? Bringing up things that never seem to fail in being a reminder of the summer, Watermelon is a great example of foods never forgotten despite the season. 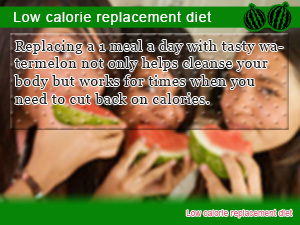 With around 90 percent water content, watermelons make a great food to hydrate your body on not to so low in calories. Not only is watermelon low calorie, they are one fruit that is great to eat when on a diet especially if you are looking for a way to cleanse your body flushing potentially harmful toxins from your body. So the next time you need to detox remember the watermelon cleanse. In this daily take on Slism, we introduce how the watermelon detox works to cleanse your body giving you a fighting chances against harmful bodily waist ruining your diet and slowing down your metabolism. How does eating watermelon work? Eating a balance diet builds on itself. No diet is complete without considering fruit diet plans to get added nutritional value to your meals as well as reducing calories. Look for other great fruit diets to help cut down on calories while helping you cleanse your body the natural way. When your metabolism slows down bodily waste products clog up in your body causing swelling and chills throughout your body not to mention is the main reason why unwanted skin conditions like cellulite occur in the first place. Before that happens, detox your body getting rid of toxins coming out clean. Thought to only be a problem during the hot summer months, enduring through heat stepping away so a place with better air conditioning, toxins in your body build up all year long. When you core body temperature decreases your muscles slow down making it harder to move. Having a lowered core body temperature may cause your metabolism to slow down making it harder to lose weight and succeed in your diet having things go as planned. Although you may not be able to do much about your core temperature, on the other hand cleansing is different. Where eating watermelon comes into play is allowing you to boost your metabolism making up for the difference in occasional chills sending your core temperature down. How it does this is by allowing you to detox freeing your body from bodily toxins harmful to your diet. Everyone has been wondering whether are not cleanse diets like the 3 Day Apple Diet helps you lose weight nevertheless detox your body. Bodily waste products get dissolved as you as you sleep. This makes it easy to build up in the morning. 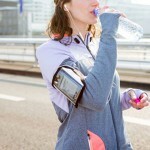 In order to effectively detox your body it's important that you boost your metabolism first. How this can be accomplished is independent of the problem, cleansing your body ridding it of potentially harmful bodily toxins that seem to drag down your metabolism. Watermelons give you Dietary Fiber and Citruline said to cause increased urination serving as a way to cleanse your body from the inside out. Not only does Citruline produce a strong Diuretic Effect on your body, in the process toxins leave your body. This is what makes watermelon detox work. 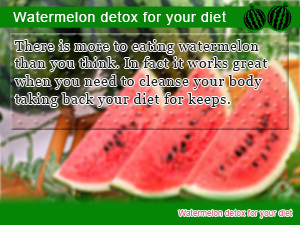 Just when you thought that, eating tasty watermelon to give your body a healthy detox, was easy, it gets simpler. There's no need to stretch the watermelon detox on for days on end. All you have to do is replace a meal with a healthy serving of watermelon. Like other replacement diets using fruit there are no strict dietary restrictions afterward. Due to the fact that eating juicy watermelon for a meal helps you to drastically reduce calories, you can enjoy the rest of your meals without worry. Although drinking cold beverages may hinder intestinal function, when the liver goes down so does your body's ability to deal with toxins in the body causing unnecessary toxic build up in your body accompanied by symptoms such as edema swelling and poor skin condition. Watermelon may not be a warm food to put in your body but it contains Gluthaione said to help improve liver function and in turn give your body what it needs to start detoxing cleansing your body of harmful toxins that have a potentially negative affect on your diet and ability to lose weight. The buck doesn't stop here. In addition to promoting healthy liver function while moving fluids throw your body making the detox carry on quicker, there is a cosmetic side to watermelon that you need to know about. Oxidation in your body is linked to aging causing wrinkles and blemishes to make surface on your skin. Lycopene found in watermelon helps slow down the effect of aging. One can even say that it is one of those fruits that speak of Antiaging. So next time you are worried about years of layers taking form in your face remember watermelons. All people should be thinking about body detoxification from time to time. For this they have to be conscious of their lifestyle and their eating habits. You are what you eat and if you want to cleanse your body, you should eat the right foods. In this article you will find everything you need to know about the matter. There is more to eating watermelon than you think. In fact it works great when you need to cleanse your body taking back your diet for keeps. Replacing a 1 meal a day with tasty watermelon not only helps cleanse your body but works for times when you need to cut back on calories. Keeping yourself looking young isn't easy to say the least. You are going to need all the help you can get. Who said eating watermelon wasn't good?